Not all grooming brushes for dogs are created equal. Some people claim the slicker brush is best, while others prefer the pin brush. 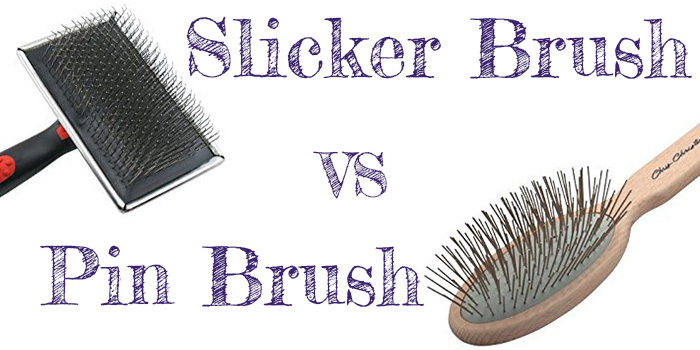 There is there is no ‘best’ brush in the slicker brush vs pin brush debate. It all depends on your dogs needs. Just as we need a hairbrush that is suited to our hair type, so too, different breeds of dogs need brushes for their specific kind of fur. There is a wide range of grooming tools to choose from and a lot of the time well-meaning owners grab the most affordable or the most popular, without first taking into consideration their dog’s fur type and what you want to achieve. Not only can this be a waste of money it can also result in an unhappy mutt and a very frustrated owner. The wrong brush can also damage the skin and cause split ends. Some pet owners make use of a pin brush or a slicker brush, while others use both for grooming. Slicker brush vs pin brush. Can you use both? Should you use both? Which one is better? And what is the difference? 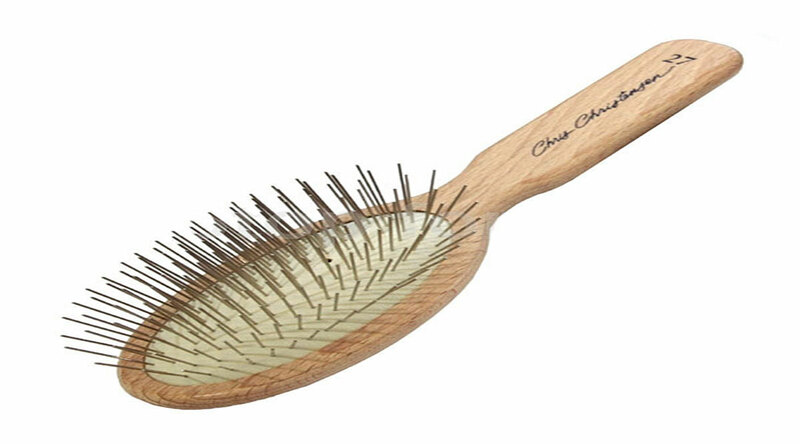 A pin brush for a dog looks very similar to the hair brush we would use on our own hair. It is usually made out of wood and it has wire pins. There is also a protective ball at the end of the pins to prevent scratching. The pin brush is suitable for most coat types, as long as it is used correctly. It works well on wire haired breeds as well as dogs with thick or double coats like Schnauzers, Poodles, Terriers, and Setters. It is also recommended for breeds with short hair that doesn’t knot or tangle. These brushes have different length pins and some have wide spaces making them suitable for all fur types. I use it for quick brush downs on a daily basis, to maintain the dog’s coat and to get rid of excess fur. It’s not difficult to identify a slicker brush. It looks like a flat paddle with a handle and it has fine wire bristles. These can be bent halfway or they have protective nubs toprevent damage to the dog’s skin. The slicker brush is best for dogs with medium or long coats, curly coats and for breeds that shed a lot like Golden Retrievers, Terriers, Spaniels, Huskies, and Newfoundlands. When used correctly the slicker brush removes knots and detangles fur, and gets rid of trapped dirt and dander from the undercoat. It’s an essential part of the grooming process for dogs with long coats as it penetrates deep into the undercoat, massaging the dog’s skin. This increases circulation and produces essential oils, which in turn moisturizes the dog’s fur, keeping it glossy and healthy looking. It gets rid of dry skin, which can lead to all sorts of skin problems. Slicker brushes are best suited to dogs with medium to long coats. 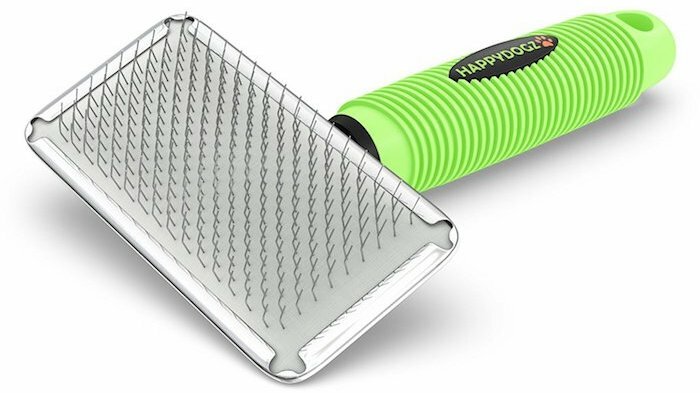 I don’t recommend using it on short hair breeds like Jack Russells, Chihauhaus, and Daschhunds – the long wire bristles will hurt and irritate these particular pooches. While some pet owners use one or the other it is a good idea to use both brushes for dogs with medium to long fur or on breeds with wiry coats. I recommend using the slicker brush to detangle and remove knots and to massage the skin. Once that is done you then use the pin brush to smooth down the coat and remove any static. This will give the coat a lovely shiney finish – show dogs usually get a quick brush over by their owners with a pin brush just before the show. A slicker brush is great but there are disdvantages to using it, especially if used incorrectly and on the wrong coat. 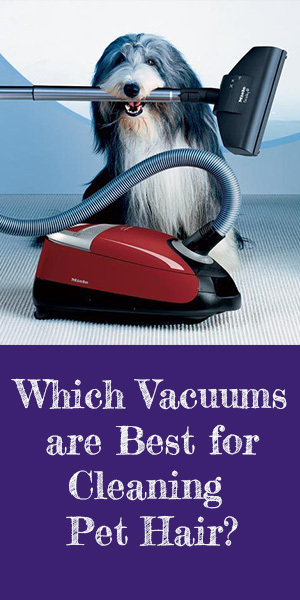 It isn’t a case of which is better, but rather which is better for your dog. Breeds with thick, wiry coats, undercoats and medium to long hair will benefit from a slicker brush and a pin brush. 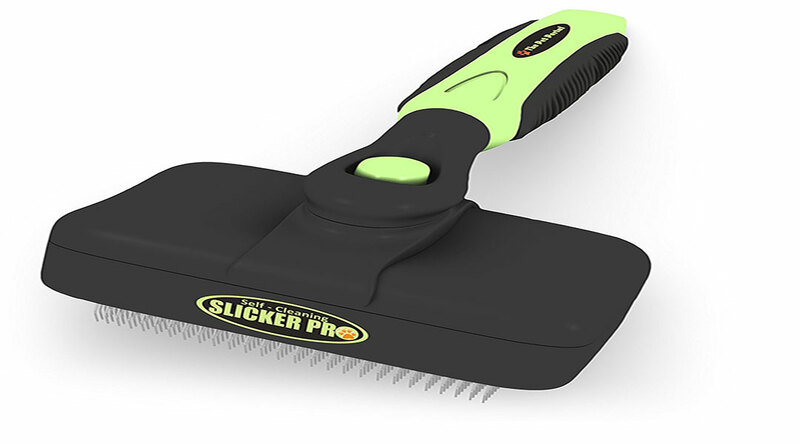 The slicker brush massages the skin, gets rid of trapped dirt and dander and removes knots and tangles. However it can make the hair static. Using a pin brush at the end of the grooming session will eliminate the static and give the coat a finshed off look. For dogs with short coats, like Jack Russells, Bulldogs, and Pugs, I would recommend only using a pin brush. The fur on these breeds is too short to knot or matt, making a slicker brush unnecessary. A pin brush is more than effective and won’t hurt or irritate the skin. The pin brush is probably more versatile and can be used on most fur types, while the slicker brush is definitely better for breeds with lots of fur, long and curly coats and undercoats. To ask which brush is better is unfair. The one you use will depend entriely on the breed of dog and in some cases, as mentioned, it would be best to use both.